The more we see, the better this looks, and we still haven't even seen a trailer! Another photo debuted in the massive LA Times 2012 preview (this one is #97) is from Ruben Fleischer's Gangster Squad, starring Josh Brolin as John O'Mara, one of the cops running the "Gangster Squad", a vigilante police force that fought the 40's/50's gangsters in Los Angeles on their own terms. 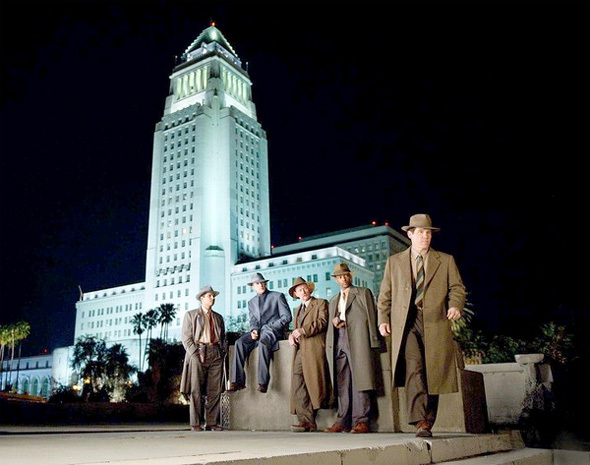 The photo features not only Brolin but the rest of his Gangster Squad, including (it looks like, small photo) Michael Peña, Ryan Gosling, Robert Patrick and Anthony Mackie, standing in front of the L.A. City Hall looking quite dapper, I must say. Check it out! The LAPD fights to keep the East Coast Mafia, run by Mickey Cohen, out of Los Angeles in the 1940s and 50s. Gangster Squad is being directed by Ruben Fleischer (of Zombieland, 30 Minutes or Less) from a screenplay written by Will Beall ("Castle"), based on Paul Lieberman's book. The cast includes Sean Penn as mobster Mickey Cohen, along with Brolin, Gosling, Peña, Patrick, Mackie, plus Emma Stone, Nick Nolte, Giovanni Ribisi, Frank Grillo and Mireille Enos. Quite an awesome cast. The film shot late last year around Los Angeles, and will be released by Warner Bros starting on October 19th this fall. Can't wait for a trailer! And LA Noire's actual title was LA Confidential. And LA Confidential's actual title was China Town. And China Town's actual title was The Big Sleep. Great cast. Is Robert Patrick rocking a handlebar 'stache? Sweet. yeap that's Robert, he's actually one of the unique characters since he wields a revolver and acts like a cowboy, instead the others are your average noir detective.